I’ve had my smile makeover for about a year. Most of them look fine, but on three of them they’re stained at the top. What does this mean? Are they faulty? Bear in mind I haven’t actually seen your porcelain veneers. However, based on what you’ve said, my suspicion is you have what is called bulky margins. When your dentist bonds your porcelain veneers, they should be flush against your teeth and gums. The three you have which are staining likely aren’t flush. Instead, they have the equivalent of a tiny shelf. This is where bacteria and other things get trapped. Without getting this fixed you are going to end up with serious decay which will derail your smile makeover. I want you to go to your dentist and show him or her what is going on. If he says it’s not bulky margins and tries to blame you, get a second opinion. One of the tricks to a good second opinion is NOT telling them who did the work or what you think is wrong with them. Just go to an expert cosmetic dentist, show them the stains you are concerned about and ask them what’s wrong. If they ask you who did it, tell them you just want their unbiased opinion and you are happy to tell them afterward. The reason you can do that is because if it is bulky margins and your dentist refuses to acknowledge that, you’ll need the other dentist’s help. With his opinion backing you up, your dentist will need to re-do those veneers so you are protected from decay. Where Do You Find An Expert Cosmetic Dentist? In your place, I’d look on the mynewsmile.com website. They have a “Find a cosmetic dentist” link. You’ll input your zip code and how far you’re willing to travel and they’ll provide you, free of charge, a list of truly expert cosmetic dentists. I have embarrassing tetracycline stains. I’ve got a budget of about $30,000. I’ve been to see two dentists. One (Dr. B—)is suggesting a full set of dental crowns for about $27,000. The other, (Dr. M—) is suggesting porcelain veneers for $46,000. I’m leaning toward the crowns because they’re in my budget and I grind my teeth. I’m assuming crowns hold up better with that. But, my husband is insisting I talk to an expert first. Do you have a recommendation? I’m glad your husband was insistent you get another opinion. I’m going to save you some potential disasters here. First, let’s address the teeth grinding. It’s a misconception that the crowns will hold up better. Neither crowns, veneers, nor your natural teeth will hold up to teeth grinding. Eventually, you’ll lose a tooth or two and end up needing expensive replacements. If your dentist hasn’t already warned you to get a nightguard for your grinding, you need a new dentist. He’s ruining your teeth. However, once you get the nightguard your teeth will be protected. They’re small and comfortable. Now onto your choice. You should be aware that tetracycline stains are some of the hardest to deal with cosmetically. You need to get the restoration opaque enough to cover the stains, yet translucent enough to look natural and beautiful. I know both the dentists you’ve had a consultation with. Dr. B— is a phenomenal cosmetic dentist. He will give you a stunning smile. Though he’s more expensive than the other quote you received, he’s worth every penny. Dr. M— is a decent dentist, but he recommended crowns to you because, while he’s a skilled family dentist, he’s not very experienced with cosmetic work. You’re in this to improve your smile. He’ll give you a functional smile but not a beautiful one. Porcelain veneers will be a much better solution for you. As you can see from the image above, your teeth have to be ground down for crowns. It’s never recommended to grind down healthy tooth structure unnecessarily. Plus, once teeth are crowned you can never go back. They will always have to be crowned. I know you’re worried about costs. And, I’m a big believer in staying within a workable budget. One way you can get the optimal choice and save money is to have the porcelain veneers placed only on the top teeth. On the bottom teeth, you can have Kör Whitening done. This brand is more effective with tetracycline stains than other teeth whitening brands. Most of the time bottom teeth are whitened and not veneered anyway. This is not a subpar suggestion for your treatment. I’ve been excited about my porcelain veneers. They’re much more elegant looking than my natural teeth. My husband says it’s given me confidence. I’m a little worried though. Recently, when I brush there’s been some red on my toothbrush. I went in for my first checkup since getting the veneers and they said I’ve developed gum disease and have to do much better brushing and flossing. I’ve always had good oral hygiene and haven’t changed anything. Is this normal with porcelain veneers? Am I supposed to brush differently with them? No. This isn’t normal at all. You should be able to brush and floss just like you always have if your porcelain veneers are properly placed. I’d like you to look at the very top of your veneers. It’s possible your dentist is a good family dentist but lacks expertise in certain cosmetic procedures. 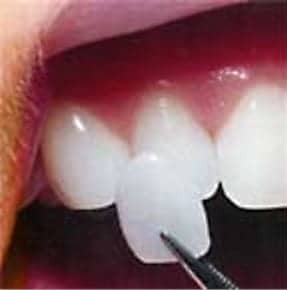 There could be bulky margins meaning the veneers don’t sit flush with your teeth creating a tiny shelf at the top. Bulky margins are a haven for bacteria leading to both decay and gum disease. If you do have bulky margins, that’s a problem. They’ll need to be replaced. The good news is you can get them replaced for free! Your dentist did them wrong. I know you love your porcelain veneers and that’s a great thing. But, you’ll love them, even more, when they won’t cause you gum disease. Go to your dentist and let him know what’s going on. If he has integrity, he’ll admit what he did and offer to make it right. If he’s not a man of integrity, don’t worry, there’s still a solution. The first thing I want you to do, if it’s financially feasible for you, is to get a water pic and try to get whatever is caught in the margins out. We don’t want your gum disease to progress. Advanced periodontitis can cause you to lose teeth. Next, go see an expert cosmetic dentist. Finding one is easy. Look on the mynewsmile.com website. They have a link for locating great cosmetic dentists. You simply put in your zip code and how far you’re willing to travel. They’ll provide you with a list of dentists in that range. Get a second opinion from the dentist on your veneers. If he or she agrees you have bulky margins, they can help you get them replaced. Basically, you’ll have two choices. 1. Give your dentist another chance to make them correctly. We all start out without being experts and need practice and experience. But, if he had trouble admitting his mistake I would be hesitant to let him try again. 2. Get a full refund from your dentist and apply that to having an artistic cosmetic dentist re-do your case. After Getting Porcelain Veneers My Teeth are Three Colors! Help Me Please! I need some help. I have always had unhappy teeth. They’re stained and one of my front teeth kind of overlaps the other one. My dentist said we’ll just make the “under” one (meaning the tooth that is being overlapped) thicker to match. She placed four veneers on my teeth. I’ve had some problems with the veneers since the beginning. First, she put the “under” one on a little crooked, so we had to re-do that one. Now, the “upper” is turning a splotchy gray. This has left me with three different colored teeth. The stained teeth, the gray veneer, and the three white veneers. What do I do? I’m beginning to think my dentist is in over her head. Wow! You’ve had a disastrous time with your smile makeover. You’re right thinking your dentist is in over her head, though she’s likely very well meaning. I always hate hearing about cases like this because it makes good general dentists look bad. Plus, it’s massively hard on patients, all while being completely avoidable. What Went Wrong With Your Porcelain Veneers? While you already know you started by allowing the wrong dentist to do your smile makeover, I want you to understand why. This will help you avoid it in the future. Later, I’ll show you how to find the right dentist. Cosmetic dentistry isn’t actually a recognized dental specialty. Many patients aren’t aware of that. Every cosmetic dentist is simply a general dentist who is willing to do cosmetic procedures. The skill levels vary greatly from dentist to dentist. The more training and artistry they have, the better the results will likely be. The next problem is the number of porcelain veneers she gave you. Four isn’t enough. The fact that you can see the stains on your other teeth in contrast with your veneers makes that obvious. Most well-done smile makeovers have a minimum of eight veneers, more if you have a wide smile. Let’s touch on the overlapping teeth. I haven’t seen a picture of what your teeth were like, but I am picturing what you described. Making one porcelain veneer thicker is a mistake. When the teeth were being prepared, she should have done some mild shaving of the tooth that was overlapping to make them flush against one another. Finally, the splotchy gray. It sounds like the bonding isn’t well done on that particular tooth and there’s some leakage with stuff getting between the veneer and the tooth. What Can You Do to Fix Your Porcelain Veneers? I’ll tell you right up front you’re going to need to have them completely re-done by a different dentist. There’s a good chance your dentist will give you a refund because the case was so poorly done. Even though she’s likely a great general dentist, she is still in need of more development and training with porcelain veneers. If she gives you a problem about the refund, let her see this post so she understands what she did wrong. When you do get your new porcelain veneers, plan on getting several more in order to cover all visible teeth when you smile. However, let’s assume four is all you can afford. That does happen. In that case, your teeth should have been thoroughly cleaned and then whitened before the veneers were designed. That way there’d be a smoother transition between the teeth. It won’t be a perfect match, but it will be a much less noticeable difference. You’re probably wondering how to find an expert cosmetic dentist. You could research their training and ask to see samples of their work, but that can be time-consuming and how would you know what training is necessary? I recommend you look on mynewsmile.com. They research cosmetic dentists and only recommend the best from each area on their website. You can plug in your zip code and they’ll give you a list of qualified cosmetic dentists within the radius you’re willing to travel. Noone can purchase their way onto their site. Instead, they’re vigorously vetted for both their technical knowledge and artistic skill. Any dentist they recommend will be a great option for you. Many of them even have a beautiful smile guarantee. Can I Custsomize My Smile? I’m about to be in a very visible position which requires public trust. I need to improve my smile, but I’m afraid if it is too “perfect” I won’t seem trustworthy. I want a pretty smile, but not a Hollywood smile, if that makes any sense. Is it possible to customize a smile this way? This is exactly what porcelain veneers are designed to do. With the right cosmetic dentist, you can completely customize your smile to anything you desire. It can be stunningly perfect. It can have some imperfections. The character of the smile has more to do with the shape of the teeth. Sightly boxier teeth command strength. Longer teeth conveys youthfulness. And there are many variations between. The key is the right dentist. Two dentists can work with the exact same smile, with the same materials and end up with completely different results. There have been many smile makeover disasters. So, how are patients supposed to know whether they’ll get the gorgeous smile or the disappointment? One way is looking at the smile galleries of dentists to see what type of results they get. But, of course, they’ll only place their best cases on the smile gallery. Another option is the mynewsmile.com website. You can search for expert, cosmetic dentists by area. They are vetted and cannot purchase their way onto the site. Why Are the Top of My Porcelain Veneers Dark? 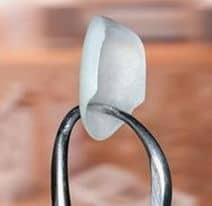 I had a porcelain veneer placed on a tooth that had a large chip. It looked great when I got it about six months ago, but recently it’s become dark at the top, near the gumline. I don’t know if it means there’s a problem, but it makes me embarrassed to smile. Can anything be done about it? There are three possibilities that come to mind, all of which are the fault of your dentist, so he (or she) should repair it without charge. 1. 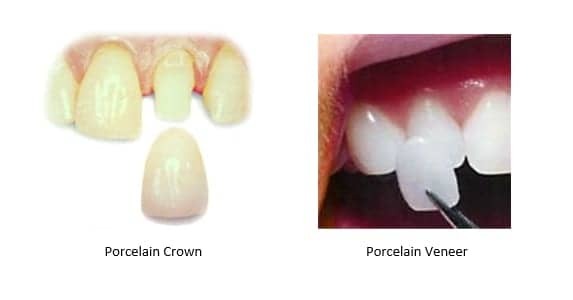 You didn’t actually get a porcelain veneer, but a porcelain fused to metal crown. Those are prone to developing a gray line at the gumline, but that doesn’t usually happen in just six months. If you were told you were getting a veneer and received a crown instead, that’s a problem. There’s no way to replace a crown with a veneer, because of the amount of tooth structure removed with crowns. It will need to be replaced with another crown. Just make sure when your dentist replaces it, they use an all-porcelain crown. Those do not develop a gray line. 2. Another option is the veneer wasn’t smoothed out enough to be perfectly flush with the gumline. The space is so tiny it’s difficult to get clean with a toothbrush. It will collect bacteria and develop decay. 3. Finally, it’s possible the bonding was flawed. This allows food and other things to get between the veneer and the tooth. Again, in addition to creating a dark spot it will lead to decay. Go see your dentist. They should make this right. It will require replacing the work done. I have a missing front tooth. The adult tooth never came in when I was younger, so I’ve always had a fake tooth there since my pre-teen years. I’m older now and am thinking about getting a dental implant placed. But, first I’ll want my teeth whiter. When I get my teeth whitened, will it also whiten my false tooth? It sounds like you have a congenitally missing tooth. It’s not uncommon. Unfortunately, teeth whitening only affects natural tooth structure, so your fake tooth will not change. However, because you’re getting a dental implant in its place it won’t matter. I would go forward with your teeth whitening, in order to get your natural teeth the color you want. Then, your dentist can make the implant crown to match the rest of your teeth.